If you have the need for Cincinnati lawn care, we offer the highest quality, most reliable lawn care services in the area! Our skilled crews use cutting edge equipment to help make your lawn the envy of all of your neighbors. Not only does it look good when we're done, we will help keep it the healthiest lawn around. With the weather in the greater Cincinnati area ever changing, wet to dry, cold to hot, it is important to look after your lawn with proper care. 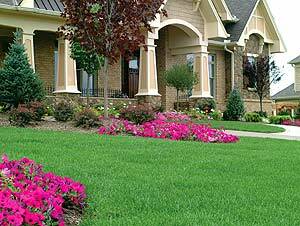 We are the full service provider in Cincinnati lawn care. When you want your lawn to look the best, call us to schedule a free proposal, you'll be glad you did! Your Cincinnati Landscaping Lawn Care program is locally formulated to suit the needs of our Cincinnati-area climate. It consists of 7 basic treatments that will further be tailored according to the needs of your lawn and the particular season. Granular fertilization will provide an early spring green-up and recovery from winter stress. All lawns will receive treatments for crabgrass and existing winter weeds. Additional information about lawn fertilization. Granular fertilizers will further thicken and develop your lawn. Supplementary controls for weeds and crabgrass are also applied at this time. 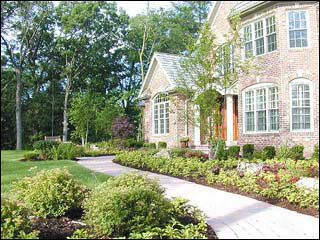 We will fertilize to maintain color and density, and to prepare lawns for summer stress. We will also inspect for weeds and insect activity and treat accordingly. Lime will be applied to fescue lawns; granular fertilizers to bermuda and zoysia. Insects can be present at this time and will be treated if necessary. Check out our Cincinnati Lawn Mowing service. Our treatments will help lawns recover from summer stress and help control fall-germinating weeds. Call us today! 513-479-7575 for a free audit of your lawn. Granular fertilizers promote root development, help Fescue lawns thicken and prepare Bermuda and Zoysia for winter dormancy. Insect & weed controls are applied as needed. Lime is applied to bermuda and zoysia, and a winter formulated granular fertilizer to fescue lawns. We will treat for broadleaf weeds where they remain. This treatment helps determine how your lawn will look next year. Lawn Overseeding is very helpful to increase the vitality of your lawn. Lawn overseeding is necessary in order to increase the density of turf grass. The amount of seed and concentration will vary based on the condition of the lawn. Our experts will establish what is the best blend of seed, time for application and the spread rate. Nearly all of the lawn overseeding we do is done with a mechanical slit seeding device that creates a small furrow in the existing lawn, without destroying it, and lays the seed. It is by far, in our part of the country, the best method for application of new seed to an existing lawn. For more information about lawn overseeding, click here. Services will be provided through the growing season. The need for de-thatching will be evaluated throughout the season. Keeping dead or dying grass and other debris from the base of your lawn will help prevent bald spots from appearing. It is an essential part of a thriving lawn. Aeration is the number 1 component of a thick, healthy lawn. In simple terms it allows water, air and nutrients to reach the root system of you lawn. Additionally it also provides a means to hold new seed in place, allowing the seed to have “deep” germination. What does that mean? When Cincinnati Landscaping aerates your lawn, there will be holes that are about 5/8” in diameter and up to 3” in depth all over your lawn. The application of new grass seed or over seeding when those holes are new, allows a certain percentage of the seed to fall into those holes. When the lawn is irrigated either by hose or rain, water then also falls into the hole thereby giving the seed or seeds a cup of water and soil to germinate in. Over time, the “plugs” of earth that were removed from those holes begin to erode and slowly fill the holes back up, leaving the germinated seed, deeply planted and growing heartily. Why is deep germination so important? When the weather turns hot and dry during July and August around here, most lawns begin to turn brown. Even some homeowners that have spent thousands of dollars on irrigation systems still watch their lawns turn brown during the hottest time of the year. This happens because the root system of their lawn is shallow based and essentially burns as the result of the heat. If they spent a fraction of the money spent on irrigation on core aeration, the lawn would remain lush and green throughout the growing season, well into the fall because the roots are deeper and much more heat and drought resistent.